Applications of PLCs, CNCs, and more! Today we will be helping you with your installation of a spindle motor. Alarms are caused by tensions issues with the belt – either being too tight or too loose in relation to the sensor. MRO Electric and Supply offers both new and refurbished FANUC Spindle amps, troubleshooting on our blog for a wide variety of parts, and repair services on any product we offer. Disconnect the wiring inside of the terminal box. Next take out the 4 bolts that hold the shroud/fan to the motor. Remove the screws from the cover of the sensor on the motor. Loosen the screws holding the sensor in place until you have enough room to be able to slide a piece of paper between the gear and sensor. Tighten the 2 screws that hold the sensor in place to make sure they do not rub against each other at all. Fasten the sensor cover back to the sensor and tighten accordingly. Reattach the shroud and the fan to the motor. Configure the wiring back to what it was originally. Now that the sensor for your FANUC Spindle amp is corrected, it should work properly. If you are still having issues we recommend looking throughout our blog as we have many articles based on helping the user troubleshoot any and all issues with their motor. Sometimes you may not have the necessary equipment to make a diagnosis on your motor, but we do. MRO Electric and Supply offers high quality repair services on all motors so you don’t have to worry about it. Please take a look at our website to see all available brands and parts we can service for you. MRO Electric and Supply has new and refurbished FANUC CNC parts available. For more information, please call 800-691-8511 or email sales@mroelectric.com. Any amount of downtime is too much for most companies. Parts will break from time to time, and repairs will be necessary. Here at MRO Electric and Supply we are dedicated to providing the best service making sure that your downtime is minimal. Human Interface Terminals(HMIs) are a crucial part of any automation process nowadays, so it is important to make sure it is working correctly. Along with selling both new and remanufactured products, MRO Electric and Supply offers both repair and exchange services. 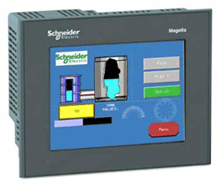 Modicon was the first manufacturer to release programmable logic controllers onto the market, and since have been one of the top brands for PLC’s. MRO Electric and Supply have all the parts necessary to run the Magelis HMI at it full potential, including panels, cables, controllers, adapters and any software that may be needed. Along with repairs, we handle installations and programming of drives and controllers so that you don’t have to. We also offer the option to retrofit your old machines with newer interfaces for the most up-to-date applications and processes. By fitting existing HMI’s with new interfaces you are able to add years to the life span of your automation set up. It is a lot easier to update and fix your existing displays and HMIs than taking the time and money to purchase and fit new parts. All of our repairs come with a 12 month guarantee. Our repair service is based on doing the right job, and getting your part back to you as soon as possible. Every part we refurbish is tested to make sure they work the way they are supposed to. Our factory-trained technicians have many years working with Modicon products. For a free Modicon Magelis HMI repair quote, please email sales@mroelectric.com or call 800-691-8511. For more information on our Modicon repair capabilities, you can visit our Modicon Repair page. Downtime is inevitable when it comes to machine automation. When production stops, orders will likely stack up quickly, hitting start on the ‘profits lost’ clock. 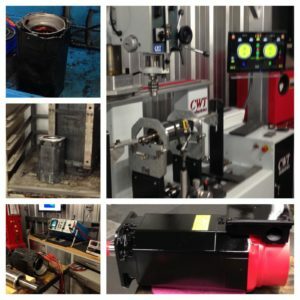 After the failed part is identified, many machine automation professionals would lean towards shipping the flawed part to get serviced as soon as humanly possible. While MRO Electric and Supply appreciates the business, we want to ensure our customers are as well-informed as possible and able to fix issues of their own, is able to. By grouping observations together and looking at them closely, many of those in the machine automation space may find that the issue can be fixed internally, rather than sending a part out to another party. Be sure to press the in-house employees for details, as someone on the clock may have witnessed the failure first-hand and would be able to provide more intimate and valuable insight as far as what may have happened. Any way to avoid a future issue is worth exploring! As many know, factory automation machines consist of several interconnected parts and components. Because of this, it’s important not to overlook related issues that have occurred or may occur. 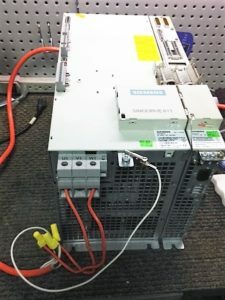 If a drive (such as a FANUC Robotics Drive) were to fail, best practice would be to send it along with the motor it’s connected with to preventative maintenance to be checked together. By consulting with the machines’ operators, you may find that other parts could be sent to preventative maintenance along with motor (such as a FANUC CNC motor) and drive. Keep in mind, certified experts will likely be able to point machine details out that others may not recognize or think of. Nobody wants to run into an issue, fix said issue, and run into it again, due to lack of attention to detail. Whether you have only two wires to unhook or twelve hundred, document everything. When you uninstall the damaged unit, label your wires. Be sure what you are using is sturdy and will remain affixed. Do not use tape that will slip off with grease or dust. Also, take before, during and after pictures of the operation. These pictures can save you from a tremendous headache later on. Also, when possible, make sure to save any parameters and record any settings before the unit has been taken out of service. By documenting all of the parts or wires that had to be disassembled as specifically as possible, you would likely be avoiding many headaches. Nobody wants to disassemble a section of a machine, later to discover a wire or bolt is misplaced, which would lead to dreaded downtime that everyone in the factory automation and manufacturing space dispises. Don’t be afraid to take a video or several photos of the disassembling process; in-depth videos or even photos are often invaluable to refer back to, especially when in a rush or a busy time of the year. In order to make your time count with the service center, be sure to prepare your explanation on a written or typed document. If there’s a possibility of more than one employee communicating with the service center, ensure they’re up-to-speed with all details that may be of help to fixing the issue or issues at hand. MRO Electric and Supply has new and refurbished parts available now, and also offers repair pricing. Be sure to check out our core exchange program to learn how to save. For more information, please call 800-691-8511 or email sales@mroelectric.com. Be sure to avoid shipping damage by packing the part or parts securely and appropriately. Nobody wants a quick and painless fix to turn into an extended fix due to laziness or lack of initiative to research correct packaging processes. Most units need 3-5 inches of packaging insulation on all sides, to ensure rough handling won’t damage the part or parts. Check out our other articles focused on robotics here. MRO Electric is determined to provide the best service and support to businesses affected by Hurricane Harvey during these difficult times as they resume operation and employees get back to work. Water-immersed electronic devices and motors in automation systems need appropriate treatment after flood water subsides. We have compiled information we learned from our past flood relief activities below, which we think our customers affected by Harvey may find useful. We also have the capability to wash and test the amplifiers and printed circuit boards at our repair facilities. If the CNC and related equipment are treated properly after being soaked with flood water, it is possible to reduce or even recover from the damage. The purpose of this section is to describe proper post-flood treatment. In case of flood, do not open cabinets and units. It is better to wait until the flood water recedes. If it is possible to drain actively, the early drainage can reduce the damage. Please remove battery cables from units and PCBs (Printed Circuit Board) as soon as possible. Flooded batteries may cause rust damage to PCB’s circuitry and could result in irreparable PCB damage. Removing the batteries will result in loss of CNC data, but it is necessary to protect the hardware from further damage. Remove cables before washing. Please properly tag or mark so you will be able to connect cables back correctly. Wash the units according to the procedure below as soon as possible. Damage will worsen if washing is delayed. Unit – Floodwater often contains contaminates such as dirt and oil. This could stick to the unit and could become difficult to remove. Use a neutral detergent, such as multipurpose kitchen detergent, tap water, and nylon brush (do not use a metal brush) to clean them as much as possible. Use a small brush such as a toothbrush and clean the entire unit with specific attention to connectors and sockets. Transformers – It is not possible to clean inside a transformer coil, however, please clean the unit as much as possible especially around the electrical terminals. Cables – Connector housings will contain flood water. Please disassemble the connectors to drain any water, clean them, and then dry by hanging the cable with the connector at the bottom. (It is also possible that flood water also enters between cable strands). Please be mindful of this. Servo and Spindle Motors – These motors cannot be disassembled by the customer. Please have MRO Electric’s engineers clean these parts. If you see waters entering inside the cover on the motor, the cover may be removed to release the water and carefully clean around the feedback assembly. Motor Drive Units – Please use flowing water to clean the motor drive units. Please refrain from submerging the unit during cleaning. After washing, please remove as much water as possible and let then dry. The electrical resistance is lower due to the moisture, so please do not attempt to mount or apply electrical power until the unit is completely dry. It will take a long time if you just leave the unit at room temperature. Transformers, especially, will require a few months if not dried to high temperature. It is necessary to use a high heat to evaporate the humidity inside the transformer. It is possible to gain enough insulation back in a few hours if you can use a drying oven with enough high heat. However, please be careful if the temperature is too high, it may melt the insulation material. A vacuum type drying oven may be useful for this type of equipment. · PCB (Printed Circuit Boards) – In 60 degree C (140 degrees F) for 1 hour. Please prepare a fanned heater. It is a good idea to use a hair dryer to send heated air (around 140 degrees F is desirable). Please be careful as it may become too hot if you send the air directly to the unit. PCB and units may be dried in a half, to one full day, but the transformer may take a few days. It is very important that insulation resistance is tested before applying power. Transformer – Measure the insulation resistance using 500V Megameter between coils, and between coil and metals such as core. The measurement should be 10 Megohm or more. Servo Motors and Spindle Motors – Measure the insulation resistance between the motor windings and ground. The measurement should be 10 Megohm or more. Please note that the encoders may be damaged by the flood water. Please open the motor case and check. If you see the sign of entering the water, the encoders may need to be replaced. MRO Electric engineers and machine tool builder engineers may need to work in sync because machine side repair and adjustment will also be required. If the insulation resistance is adequate, then the unit may be installed. Confirm all cable connections and wiring, then apply power and confirm the operation. If insulation is not sufficiently recovered due to insufficient drying, there is a possibility of ignition due to short circuit or heat generation, so pay attention to the generation of smell and smoke for a while after energization, immediately turn off the power when there is an abnormality. If parameters were lost and a recent back up is not readily available, it is our recommendation to contact the machine tool builder to assist you. They will also be able to assist in any machine side adjustments and/or set up procedures before the final operation is started. Our goal is to quickly and safely return your machine back into production. Do not hesitate to contact MRO Electric if you believe your equipment is damaged and is in need of testing and/or repair, or if you require a replacement part. Please contact us at 800-691-8511 or at sales@mroelectric.com. MRO Electric and Supply provides fast and reliable FANUC servo motor repairs on all types of FANUC motors. Our factory-trained repair technicians have years of expertise with FANUC servo systems, and our facility provides them best in class testing equipment that will have your FANUC motors repaired, tested, and aligned precisely to the manufacturer’s specifications. Our large inventory of spare parts and replacement components allow for us to repair your motor quickly to get you back up and running with minimal downtime. MRO Electric is able to recondition and test each of your motor’s components. This includes performing re-windings and replacing bearings, as well as repairing armatures, housings, encoders, resolvers, output shafts, and flanges. As one of the nation’s leading FANUC servo motor repair specialists, MRO Electric places a strong emphasis on reliable customer service, great pricing, fast turnaround, and quality repairs. Each of our FANUC servo repairs come with a minimum 12-month warranty. MRO Electric can repair all FANUC motors and parts, both new and old. Once your motor is received, it is thoroughly cleaned and reconditioned. 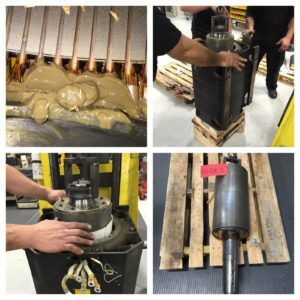 Our trained technicians disassemble, inspect, and test each individual motor component. After each non-functioning component is replaced or repaired, we test motor function fault, brake, encoder, and thermistors. We then commission the motor using one of our drives, testing it in both forward and reverse for at least an hour. 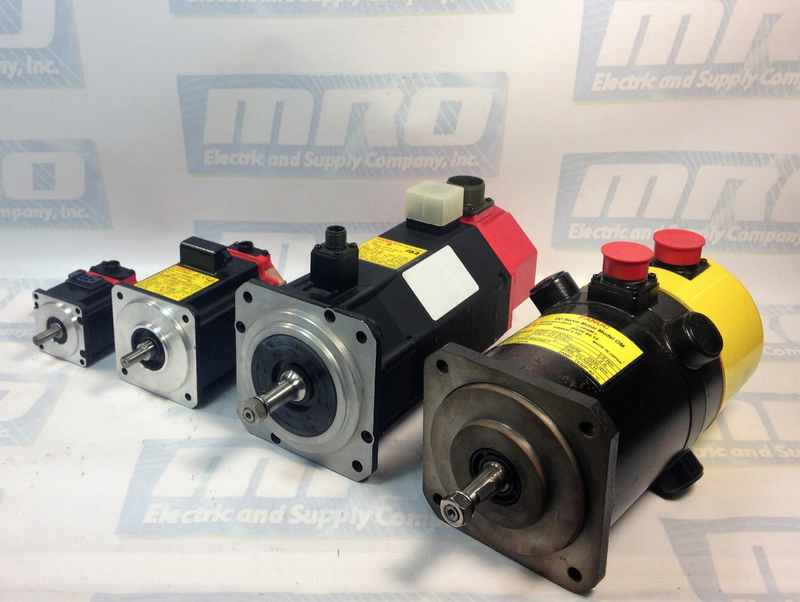 MRO Electric also stocks both new and refurbished FANUC motors with rush shipping options available. If you require a working motor immediately, you can take advantage of our core exchange policy to return your non-functioning motor in for credit. For a free FANUC servo motor repair quote, please email sales@mroelectric.com or call 800-691-8511. For more information on our FANUC repair capabilities, you can visit our FANUC Repair page. Here at MRO Electric and Supply, our repair shop is designed to provide the highest quality drive repairs on all FANUC spindle and servo amplifiers. With a variety of testing platforms and a large stock of replacement components, we can fully repair and refurbish your FANUC drive to “like new” condition. Each of our FANUC Drive repairs come with a 12-Month Warranty. When your non-functioning FANUC drive is first received, our repair technicians go to work inspecting, disassembling, and thoroughly cleaning your unit. Throughout this process, we will evaluate your drive to determine the primary cause of failure. Our technicians test and replace any non-functioning components on your FANUC Drive. We also replace any worn parts, as well as components that are prone to failure. This includes resistors, diodes, IGBT’s, capacitors, electrolytic caps, relays, and fans. We have one of the largest stocks of FANUC circuit boards on the globe. We continue to troubleshoot and replace components until we are confident that your FANUC drive can move onto the testing phase. With our numerous testing platforms, we perform a variety of dynamic functional tests on your FANUC drive to ensure reliability. After these procedures, your FANUC drive is left to run overnight in our facility to certify its consistency. Once your FANUC drive has passed our strict testing and quality control procedures, it is carefully packaged and shipped back to you in perfect working condition. Our repair pricing can save you up to 75% compared to buying new drive. Save time and reduce costs by having your FANUC drive refurbished by the experts here at MRO Electric. For more FANUC Drive repair information or to request a free quote, please call 800-691-8511 or email sales@mroelectric.com. 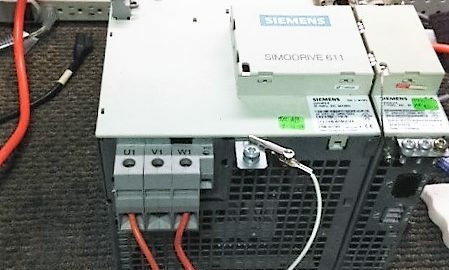 Have a Siemens Drive down? Get an Instant Quote now. At MRO Electric, we are constantly fine-tuning and upgrading our repair capabilities and turnaround times. We perform Siemens drive repairs and refurbishments on Simodrives, Sinamics, Sinumerik, Micromaster, and Simoreg drive series. We also perform repairs on Simatic panels and a variety of Siemens motors. We offer quick, pre-priced repair estimates so you know from the beginning how much your repair will cost. Our mission is to keep our Siemens drive repairs to the highest quality standards while retaining our lowest cost guarantee. We want to get your machine back up and running as quickly as possible. Our normal turnaround time for Siemens drive repairs is 7-10 days, but we can often accommodate rush repair jobs if necessary. Once we receive your Siemens drive, it is thoroughly cleaned and visually inspected for any visible deficiencies. We then methodically test every component on the drive, replacing any that no longer function or meet our strict quality standards. After all faulty components are replaced, the drive must complete all of our functional testing requirements before being packaged and shipped back to its owner. All of our repairs come with a 12-Month Complete Coverage Warranty. If any problems occur in that time frame, MRO Electric will repair or replace your drive at no charge. For more information or to request a repair quote, please visit our Siemens Repair page. You can also email sales@mroelectric.com or call 800-691-8511. We recently rebuilt some Fanuc AC Spindle Motors, including one motor part number A06B-0828-B302. The customer was in a rush and needed this 357 lb motor so that he could get back up and running right away. We didn’t have the motor in stock, but we did have all of the parts in stock to build the motor. Check out all of our Fanuc CNC products on our website. Within 3 days we were able to rebuild, repaint, and fully test the motor with our FANUC Spindle drives to get it ready to go back out via freight to the customer, so they were back up and running in less than a week. Our rebuilds for these size motors usually take 2-3 days, so we were right on schedule for this Fanuc motor. We have the full list of motors that we stock and repair here, and you can email sales@mroelectric.com for more info. We also have pictures of the finished product below as an example. Interested in purchasing a part? Request a Quote! PLC vs. DCS: What’s the difference?